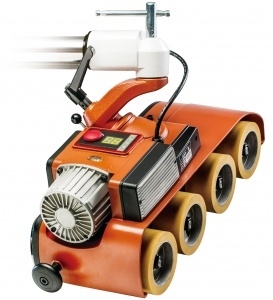 Experience more torque than standard 1HP AC motor feeders with the 2/3HP DC Brushless Motor Feeders. 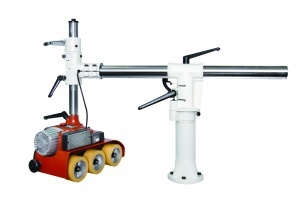 The patented DC Brushless Servo Variable Speed Power Feeders are the most innovative feeders in the woodworking industry. Designed for heavy-duty woodworking on shapers and table saws, experience increased torque while decreasing energy costs, thanks to a powerful and efficient DC Brushless Motor. We carry the most recently updated version of the DC Feeders which feature 2/3HP DC Motors. With pure variable speed adjustment, easily set your desired speed quickly with simple digital controls and without having to change any gears. Also, when pushing parts against your shaper fence, instantly rotate the feeder 90° without having to loosen and re-tighten various joints. No more changing out gears. Easily identify your feed rate and change the speed quickly with the turn of a button at 1 FPM increments until you reach your desired speed from 5-72 FPM (7-86 for DC70) in forward or reverse. 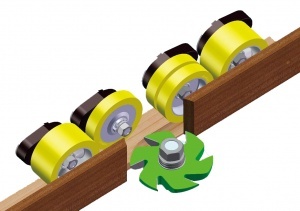 No longer do you have to completely remove a wheel in order to have clearance when running stock on a shaper or table saw. 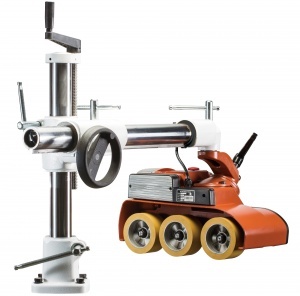 Run the DC30 or DC40 feeder with standard wheels or simply replace them with narrow RU21 wheel(s) to keep distance between the roller and shaper cutter or to have blade clearance by straddling a saw blade. 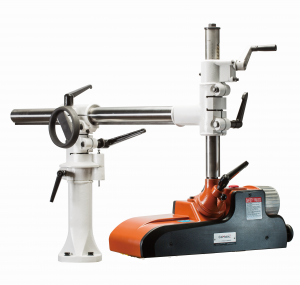 The gooseneck attachment on the end of the Power Feeder Stand allows for a quick 90 degree adjustment to position the feeder against the table or at a perfect angle against the fence - No more tinkering around with the joints to make sure it is in perfect position. Also adjust the feeder to incline feed when needed. An incline feeding adjustment indicator helps position the feeder at the desired angle. "I have had the DC30 for almost a year and I really like it. There are two features that have made our manufacturing process easier and more efficient - the smart stand and the variable speed. The DC30 is our work horse power feeder. We run it up to 12 hours a day and it has yet to have an issue. The smart stand is quick and easy to set up. For anyone who needs a power feeder that is both reliable and robust, I would highly recommend the DC30." "This seems to be an excellent machine. I have began to realize how time saving the variable speed is. I wish they would recall all my old ones for the new variable speed models. Its a great advantage when time is money." "The DC40 suits me very well cause I love options, and I get options with this feeder. 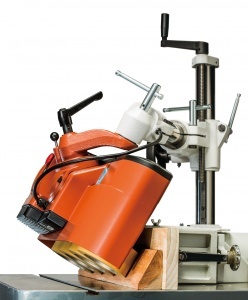 I'm not stuck with a fixed speed, and I can use it on my table saw, shaper, and band saw. I also can rewire the machine to change voltage if I have to. 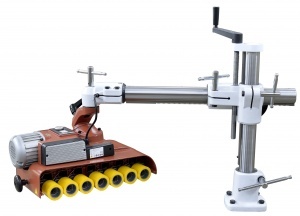 It is also very easy to change to a single or double wheel layout. The start and stop is very responsive, as is the forward and reverse." "It (DC40) is very smooth, Quiet and easy to Adjust. We do all custom work and so it is used for Door Sticking, Mouldings, Raised Panels and all kinds of Special Setups." "(DC70)Great heavy duty machine that works great (better than the 4 wheel feeders), especially for the small parts we run on our shaper. We have added 2 of these feeders recently to our operation." It (DC40) is awesome. Plenty of torque... we love it. It protects everybody's hands, and it makes cutting straight lines easier on a table saw.